A tough weekend for some United Academy sides, some improved displays for others as the goals flowed in the Subway National Youth League. A late winner for the 12s against Portadown while the Armagh side got their revenge at u14 level with the win in Subways highlighted game of the day at the Showgrounds. An exciting draw for the 13s in Lurgan against Glenavon while the Armagh theme continued as the 17s returned to the top of the table with a four goal win over Loughgall on Friday evening. Tickets are now on sale for the Youth Academy grand Christmas draw, contact any player, coach or committee member for your chance to enter. The first half was a tale of two goalkeepers - Ryan Mcgrath and his Portadown counterpart made save after save and combined to keep the score 0-0 at half time. Ballymena went behind on a Portadown counter attack but almost hit back when Jonny Douglas beat the keeper only to see the ball roll wide. However he did find the equaliser as Ben Dallas whipped a cross on and Joshua Balmer shot rebounded to Douglas who hammered the rebound into the roof of the net. Mark Lowry and Dallas had shots well saved and the game appeared to be heading for a draw with 20 seconds remaining. Ben Dallas beat his marker and flashed a pinpoint cross to Balmer who finished first time to seal the win. MOM - Ryan McGrath. Glenavon 2, BUYA 2: Leading this game into the last two minutes, the sky blues were disappointed not to take all three points,however this was a much improved performance from the 2003 group. The Lurgan blues took the lead as United defenders failed to track the Glenavon striker who finished well. The Skies did not let the heads drop and got back into the game with another lovely free kick floated in by Blake Douglas. Jordan McMullan was outstanding in midfield aided by Worthington, Gilchrist and McCullough who linked the play up well. Adger raced away and hammered home for the lead,until the late salvo from Glenavon and then further drama at the death as stand in goalkeeper Connor Louw pulled off an outstanding injury time save for the light blues. MOM - Josh Kirkpatrick. BUYA 0, Portadown 4: The sky blues entertained Portadown and the first twenty minutes were pretty even. The away side took the lead when they scored an absolute screamer from distance and ten minutes later scored an equally impressive second. A good start to the second period was needed and this led to Ballymena getting caught on the break and conceded the third goal of the game. When Portadown added a fourth no one could argue with their supremacy and the game was lost for the youth academy side. BUYA 1, Crusaders 7: A tale of two halves at the 3G on Friday night. The 15s kept their shape well against the table topping Crues and took the lead with a well taken Jonny Patterson effort. 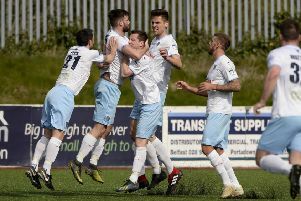 A nightmare second half followed for the sky blues as the Crues international players stepped up to the mark and hammered any hesitancy in the United defence. Crues frontman Galbraith especially showed why a host of cross channel clubs have been after the young player. A harsh lesson for United after a good first period. Loughgall 1, Ballymena United 4: Ballymena travelled to Portadown to play Loughgall and won 4-1. Playing against the strong wind in the first half Loughgall put the Ballymena defence under pressure. Ballymena created chances but Loughgall took the lead with a shot from distance. Ballymena got back on level terms just before half time with following passing move starting in their own half and finished with Calum McGall scoring from Bailey McNeills cross. Ballymena controlled long periods of the second and took the lead when Zack Herbinson headed home an Adam McCelland cross. Ballymena extended their lead with a great from outside the box by Johnny Carson. Philip Maybin and Luke Stockman went close before Zack Herbinson curled a shot into the top corner from the edge of the box. Near the end Owen Best made two great saves to keep the score 4-1.